Sondra Wilson has been putting together school carnivals and high school events for over 25 years. From listening to hundreds of coordinators and observing everything from set up to tear down, she has authored the booklet Carnivals Made Easy. She has all the inside knowledge from what a dedicated circuit is (and believe me you need to know this), to how many servings of cotton candy a person can make in three hours! CC&E’s team will work with you to create a custom event based on all of your needs and guide you through the steps to have a seamless event. Want to learn more about event planning? 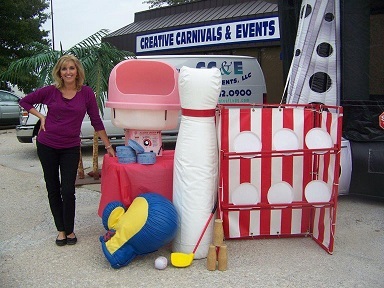 Creative Carnivals & Events, LLC wants to share our expertise in event planning with you – for FREE! Submit your request, and we will email it to you within one business day. We’d love to hear from you and help you get started on your upcoming event. Please email us or call us at 913-642-0900.